Husband and wife duo Mates of State are a brilliant fusion of complementary aspects. Their vocals are at times yelped, at times smoothly purred. Sometimes the synthesizers are making otherworldly noises while the drums bash away, and sometimes a dreamy melody is complemented with a beat like a pulse. This isn’t a couple wrapped up in love songs; instead they’re making delicious power pop. “Palomino” is a kickstart opener, filled with the duality that makes Mates of State so unique. Kori Gardner and Jason Hammel are not out to harmonize and be cute. They’re more likely to make people jump up and down on the dance floor rather than slow dance, gazing wistfully into each other’s eyes. “Maracas” has a delightfully retro sound, and “Changes” is slow enough that you can easily pick up on the words and belt along in the privacy of your home (or in public, if that’s your thing). 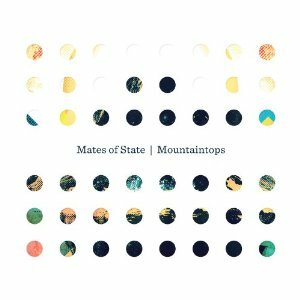 Mountaintops shows that Mates of State are just as in-command of their own sound as ever, and by producing their own work, they’re able to develop brilliant hooks and nuanced, layered pop gems. It’s certainly worth the wait for new material since 2008’s Re-Arrange Us and hopefully marks the band’s climb into the spotlight.